An advertisement was published in daily jang regarding booking of residential plots in MORAECHS, and it read “Coming Soon”. Since it is a co-operative society by the employees of a government department, people are showing keen interest in this project. We are sharing the available information on the background and legality of this society, so that our readers can have better understanding of this upcoming housing project. 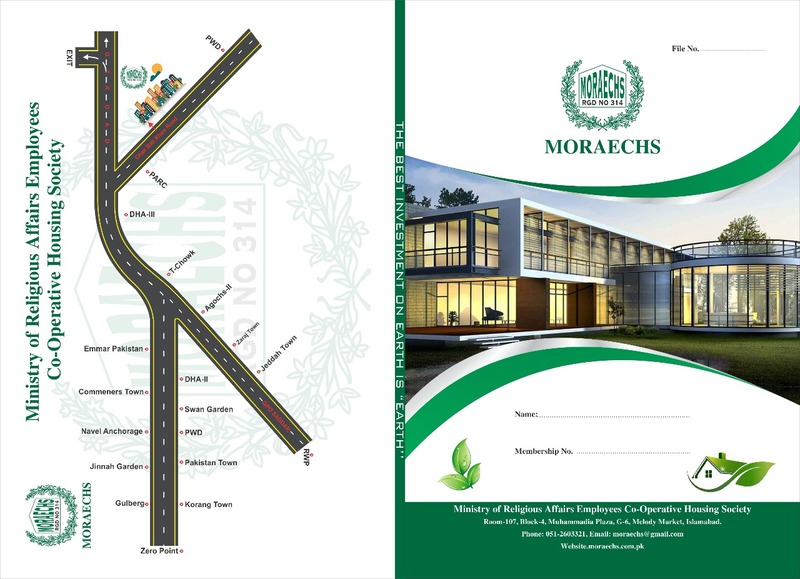 According to the advertisement, a new housing scheme of MORAECHS is coming soon at the junction of Islamabad and Rawalpindi, and it is going to open bookings of 5 marla, 7 marla, 10 marla and 1 kanal residential plots on installments. As per ICT records, this new housing scheme is currently in process of Land Acquisition. After completion of required land procurement process, the site plan will be submitted to CDA for LOP approval. After the layout plan approval, the society will do the needful, and apply for NOC. After the NOC is issued by CDA, the society will be eligible to sell its plots and carry out further development work. It is quite possible that MORAECHS may already have worked out on the pre-requisites before this public advertisement, however LOP and NOC are still to be issued by CDA. As you can see above, MORAECHS has very small projects in Lahore and Multan comprising 80 kanals and 9 kanals 8 malra respectively. 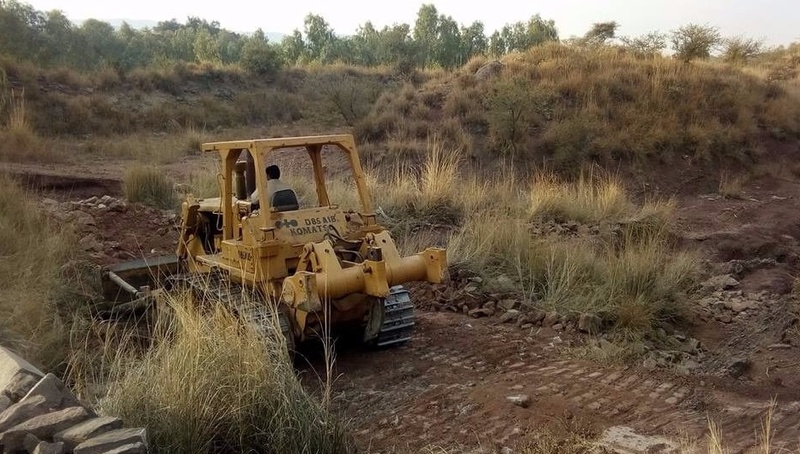 Both projects have their LOPs approved by relevant housing authorities, while this new housing project in Islamabad is still under process of land acquisition. As you can see on the map attached above, MORAECHS is situated on GT Road and Chak Beli Road close to DHA Phase 3 Islamabad. Current access is through GT road, however future access will be easier through Rawalpindi Ring Road. 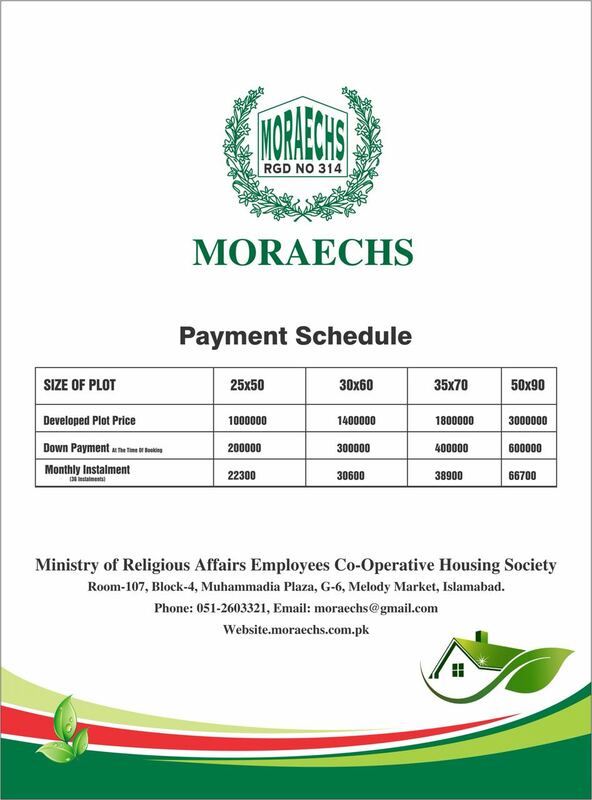 Ministry of Religious Affair Cooperative Housing Scheme Islamabad is currently offering 5 marla, 10 marla and 1 kanal residential plots on 3 years installment plan. Bookings start with about 20% down payment, while remaining amount is payable in 36 monthly installments. 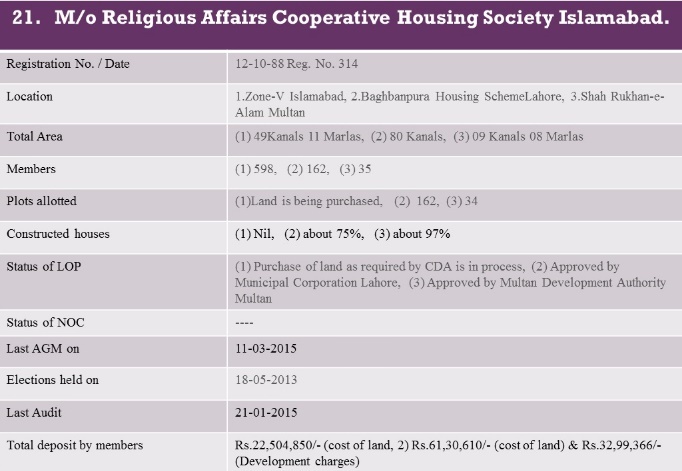 The ministry of religious affairs housing scheme Islamabad is yet to be officially launched, however pre-launch bookings of residential plots have started by certain dealers in Islamabad. It is recommended to wait for issuance of NOC from CDA before you consider buying plots in MORAECHS Islamabad.